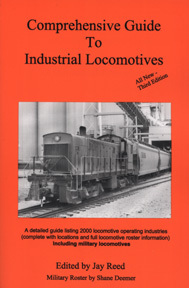 The Comprehensive Guide To Industrial Locomotives is the standard reference for industrial operations of the United States. The book contains up to date rosters for operations in every state in which they exist. Rosters include complete listings of all current locomotives. Illustrated with 85 photographs of locomotives from nearly every state. In the nine years since the Comprehensive Guide to Industrial Locomotives was originally published. it has been quite well received by rail enthusiasts, locomotive historians, rail equipment manufacturers and suppliers. Until the first Ed. arrived on the scene, industrial operations were a relativrely uncharted realm. Now, Industrial locomotives, which are often rare, old... some of the most interesting locomotives to be found left operating in this country, can be tracked with ease. The Comprehensive Guide to Industrial Locomotives, 3rd Edition will be an invaluable addition to your library - for both the armchair entusiast or the active locomotive hunter. Dozens of enthusiastic fans have contributed hundreds of updates, additions and corrections to the original listings. Reader contributions from all over the World have made the Comprehensive Guide a truly comprehensive and current reflection of today's industrial railway scene. So, how much has really changed ? Look at Iowa - which seems about typical. The 1st Ed. lists 70 locomotives in Iowa, the 2nd ed. list 89 and the 3rd Ed. lists 98. Of those, only 20 are listed as the same locomotive, same plant, same company, as they are found in the 1st Ed. Likeswise, only 56 are listed the same as found in the 2nd Ed. This is a fast-changing subject - Don't get left behind! Shane Deemer's authoritative and up-to-date rosters ot the Department of Defense rail operations are an added bonus! In recent years, many changes have occurred in the United States military rail operations. The military locomotive roster in the Comprehensive Guide to Industrial Locomotives will keep you on the front lines of these changes.